1.250 g/L at 0°C, 1 atm. 1.145 g/L at 25°C, 1 atm. Carbon monoxide, with the chemical formula CO, is a colorless, odorless, and tasteless gas. It is the product of the incomplete combustion of carbon-containing compounds, notably in internal-combustion engines. It consists of one carbon atom covalently bonded to one oxygen atom. It is a gas at room temperature. It has significant fuel value, burning in air with a characteristic blue flame, producing carbon dioxide. Despite its serious toxicity, CO is extremely useful and underpins much modern technology, being a precursor to a myriad of useful—even life-saving—products. Carbon monoxide is so fundamentally important that many methods have been developed for its production. The downside of this method is if done with air, it leaves a mixture that is mostly nitrogen. CO is the anhydride of formic acid. As such, it is conveniently produced by the dehydration of formic acid, for example, with sulfuric acid. Another laboratory preparation for carbon monoxide entails heating an intimate mixture of powdered zinc metal and calcium carbonate. The leftmost resonance form is the most important. Nitrogen is isoelectronic to carbon monoxide, which means that these molecules have the same number of electrons and similar bonding. The physical properties of N2 and CO are similar, although CO is more reactive. Carbon monoxide is a major industrial gas that has many applications in bulk chemicals manufacturing. High volume aldehydes are produced by the hydroformylation reaction of alkenes, CO, and H2. In one of many applications of this technology, hydroformylation is coupled to the Shell Higher Olefin Process to give precursors to detergents. Methanol is produced by the hydrogenation of CO. In a related reaction, the hydrogenation of CO is coupled to C-C bond formation, as in the Fischer-Tropsch process where CO is hydrogenated to liquid hydrocarbon fuels. This technology allows coal to be converted to petrol. In the Monsanto process, carbon monoxide and methanol react in the presence of a homogeneous rhodium catalyst and HI to give acetic acid. This process is responsible for most of the industrial production of acetic acid. Most metals form coordination complexes containing covalently attached carbon monoxide. Only those in lower oxidation states will complex with carbon monoxide ligands. This is because there must be sufficient electron density to facilitate back donation from the metal dxz-orbital, to the π* molecular orbital from CO. 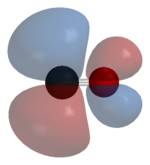 The lone pair on the carbon atom in CO, also donates electron density to the dx²−y² on the metal to form a sigma bond. In nickel carbonyl, Ni(CO)4 forms by the direct combination of carbon monoxide and nickel metal at room temperature. For this reason, nickel in any tubing or part must not come into prolonged contact with carbon monoxide (corrosion). Nickel carbonyl decomposes readily back to Ni and CO upon contact with hot surfaces, and this method was once used for the industrial purification of nickel in the Mond process. Many metal-CO complexes are prepared by decarbonylation of organic solvents, not from CO. For instance, iridium trichloride and triphenylphosphine react in boiling methoxyethanol or DMF to afford IrCl(CO)(PPh3)2. In the presence of strong acids and water, carbon monoxide reacts with olefins to form carboxylic acids in a process known as the Koch-Haaf reaction. In the Gattermann-Koch reaction, arenes are converted to benzaldehyde derivatives in the presence of AlCl3 and HCl. Organolithium compounds, such as butyl lithium, react with CO, but this reaction is seldom used. Although CO reacts with carbocations and carbanions, it is relatively unreactive toward organic compounds without the intervention of metal catalysts. With main group reagents, CO undergoes several noteworthy reactions. Chlorination of CO is the industrial route to the important compound phosgene. With borane, CO forms an adduct, H3BCO, which is isoelectronic with the acylium cation [H3CCO]+. CO reacts with sodium to give products resulting from C-C coupling such as Na2C2O2 (sodium acetylenediolate) and Na2C4O4 (sodium squarate). Carbon monoxide, though thought of as a pollutant today, has always been present in the atmosphere, chiefly as a product of volcanic activity. It occurs dissolved in molten volcanic rock at high pressures in the earth's mantle. Carbon monoxide contents of volcanic gases vary from less than 0.01 percent to as much as 2 percent, depending on the volcano. It also occurs naturally in bushfires. Because natural sources of carbon monoxide are so variable from year to year, it is extremely difficult to accurately measure natural emissions of the gas. Carbon monoxide has an indirect radiative forcing effect by elevating concentrations of methane and tropospheric ozone through chemical reactions with other atmospheric constituents (for example, the hydroxyl radical, OH.) that would otherwise destroy them. Carbon monoxide is created when carbon-containing fuels are burned incompletely. Through natural processes in the atmosphere, it is eventually oxidized to carbon dioxide. 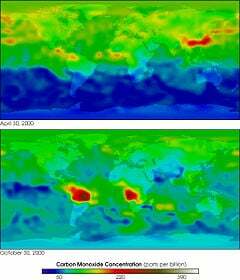 Carbon monoxide concentrations are both short-lived in the atmosphere and spatially variable. Anthropogenic CO from automobile and industrial emissions may contribute to the greenhouse effect and global warming. In urban areas, carbon monoxide, along with aldehydes, reacts photochemically to produce peroxy radicals. Peroxy radicals react with nitrogen oxide to increase the ratio of NO2 to NO, which reduces the quantity of NO that is available to react with ozone. Carbon monoxide is also a constituent of tobacco smoke. Carbon monoxide is used in modified atmosphere packaging systems in the U.S., mainly with fresh meat products such as beef and pork. The CO combines with myoglobin to form carboxymyoglobin, a bright cherry red pigment. Carboxymyoglobin is more stable than the oxygenated form of myoglobin, oxymyoglobin, which can become oxidized to the brown pigment, metmyoglobin. This stable red color can persist much longer than in normally packaged meat and, thus, increases shelf life. Typical levels of CO used are 0.4 percent to 0.5 percent. The technology was first given "generally recognized as safe" status by the FDA in 2002, for use as a secondary packaging system. In 2004, the FDA approved CO as primary packaging method, declaring that CO does not mask spoilage odor. Despite this ruling, the technology remains controversial in the U.S. for fears that it is deceptive and masks spoilage. One reaction in the body produces CO. Carbon monoxide is produced naturally as a breakdown of hemoglobin, heme, is a substrate for the enzyme heme oxygenase which produces CO and biliverdin. The biliverdin is converted to bilirubin by biliverdin reductase in macrophages of the reticuloendothelial system. The lipid soluble unconjugated bilirubin is transported in the blood bound to albumin, taken up by the hepatocytes, conjugated with glucuronic acid and transported into the bile canaliculi for excretion from the body. The endogenously produced CO may have important physiological roles in the body (for example, as a neurotransmitter). CO is a nutrient for methanogenic bacteria, a building block for acetylcoenzyme A. This theme is the subject for the emerging field of bioorganometallic chemistry. In bacteria, CO is produced by the reduction of carbon dioxide by the action of the enzyme carbon monoxide dehydrogenase, an Fe-Ni-S-containing protein. A haeme-based CO-sensor protein, CooA, is known. The scope of its biological role is still unclear, it is apparently part of a signaling pathway in bacteria and archaea, but its occurrence in mammals is not established. CO is also currently being studied for its anti-inflammatory and graft protection properties in the field of transplant immunology. Carbon monoxide was first prepared by the French chemist de Lassone in 1776, by heating zinc oxide with coke. He mistakenly concluded that the gaseous product was hydrogen, as it burned with a blue flame. The gas was identified as a compound containing carbon and oxygen by the English chemist William Cruikshank in the year 1800. The toxic properties of CO were first thoroughly investigated by the French physiologist Claude Bernard around 1846. He poisoned dogs with the gas, and noticed that their blood was more rutilant in all the vessels. "Rutilant" is a French word, but also has an entry in English dictionaries, meaning ruddy, shimmering, or golden. However, it was translated at the time as crimson, scarlet, and now is famously known as "cherry pink." During World War II, carbon monoxide was used to keep motor vehicles running in parts of the world where gasoline was scarce. External charcoal or wood burners were fitted, and the carbon monoxide produced by gasification was piped to the carburetor. The CO in this case is known as "wood gas." Carbon monoxide was also reportedly used on a small scale during the Holocaust at some Nazi extermination camps. Carbon monoxide is a significantly toxic gas and is the most common type of fatal poisoning in many countries. Exposures can lead to significant toxicity of the central nervous system and heart. Following poisoning, long-term sequelae often occur. Carbon monoxide can also have severe effects on the fetus of a pregnant woman. Symptoms of mild poisoning include headaches and dizziness at concentrations less than 100 ppm. Concentrations as low as 667 ppm can cause up to 50 percent of the body's hemoglobin to be converted to carboxy-hemoglobin (HbCO) and ineffective for delivering oxygen. Exposures of this level can be life-threatening. In the United States, OSHA limits workplace exposure levels to 35 ppm. The mechanisms by which carbon monoxide produces toxic effects are not yet fully understood, but hemoglobin, myoglobin, and mitochondrial cytochrome oxidase are thought to be compromised. Treatment largely consists of administering 100 percent oxygen or hyperbaric oxygen therapy, although the optimum treatment remains controversial. Domestic carbon monoxide poisoning can be prevented by the use of household carbon monoxide detectors. ↑ A.F. Holleman and E. Wiberg, Inorganic Chemistry (San Diego: Academic Press, 2001, ISBN 0123526515). ↑ O.R. Gilliam, C.M. Johnson and W. Gordy, Microwave Spectroscopy in the Region from Two to Three Millimeters, Physical Review 78 (2): 140. ↑ W. Kutzelnigg, Einführung in die Theoretische Chemie (Wiley-VCH, ISBN 3527306099). ↑ C. Elschenbroich, and A. Salzer, Organometallics: A Concise Introduction, 2nd edition, (Wiley-VCH: Weinheim, 2006, ISBN 3527281657). ↑ L. Mond, K. Langer, and F. Quincke, Action of carbon monoxide on nickel, Journal of the Chemical Society 1890: 749-753. ↑ H. Koch and W. Haaf, "1-Adamantanecarboxylic Acid," Organic Syntheses 5 (1973): 20. ↑ G. H. Coleman and D. Craig, "p-Tolualdehyde," Organic Syntheses 2 (1943): 583. ↑ N. Chatani and S. Murai, "Carbon Monoxide," in Encyclopedia of Reagents for Organic Synthesis L. Paquette (ed.) (New York: J. Wiley, 2004). ↑ S. Sorheim, H. Nissena, and T. Nesbakken, The storage life of beef and pork packaged in an atmosphere with low carbon monoxide and high carbon dioxide, Journal of Meat Science 52(2): 157-64. ↑ Food Safety Magazine, Low-Oxygen Packaging with CO: A Study in Food Politics That Warrants Peer Review. Retrieved June 10, 2015. ↑ G. Jaouen (ed. ), Bioorganometallics: Biomolecules, Labeling, Medicine (Weinheim: Wiley-VCH, 2006, ISBN 352730990X). Carbon Monoxide. NIOSH Pocket Guide to Chemical Hazards. This page was last modified on 10 January 2017, at 20:41.